NBC NEWS: The GOP Tried Trump-Style Tax Cuts in Kansas. What a Mess. WASHINGTON — Republicans and Democrats are gearing up for a fight over trillions of dollars in tax cuts. But the first battleground is thousands of miles away in Kansas, where the failure of a similar plan has become a rallying cry for opponents. Earlier this year, Kansas’ GOP-controlled legislature voted to effectively end a five-year push to slash taxes on individuals and businesses after revenues plummeted and forced deep cuts and tax hikes elsewhere. In doing so, they overturned a veto by Gov. Sam Brownback, a Republican who drew national attention in conservative circles when he launched his ambitious tax-cut program in 2012. For Democrats, Kansas has become Exhibit A in their prosecution of the Trump tax cuts. It’s routinely cited as evidence the new GOP proposal won’t grow the economy or pay for itself, and that proposed business tax reduction similar to Brownback’s will create a new loophole for wealthy individuals to exploit. Schumer is one of many Democrats to bring up the state’s budget woes in recent weeks, giving Kansas folklore status among progressives. Sen. Bernie Sanders, I-Vt., has highlighted the Kansas tax cuts throughout the year, which he said “devastated the state,” and tweeted his congratulations when the state legislature reversed them. Democrats aren’t the only ones digging into Kansas either. Academics have studied the state’s unique experience for policy clues. Some small-government conservatives see lessons worth salvaging even as they disagree with Democrats’ broader interpretation. And the players in Kansas are weighing in as well, with Republicans on both sides of the tax fight debating where things went wrong. Like Brownback, Trump is proposing simplifying and lowering individual tax rates. Like Brownback, he’s pushing an unusual tax cut for business owners that critics say opens up a major loophole. And, much more than Brownback ever did, Trump’s team is promising that explosive growth will make up for the cost of their cuts. Brownback pitched his plan as a test of conservative policy. First, the state would cut income taxes (the top rate went from 6.45 percent to 4.9 percent) and eliminate taxes entirely on pass-through income for business owners. If, as the governor predicted, the cuts attracted new businesses, added jobs and boosted funding for schools and local governments, then income tax rates would decrease even further as part of a “March to Zero” that would end them entirely. Things, however, did not go according to plan. Over the next five years, state and local governments battled over a dwindling revenue supply, including a roughly $700 million drop-off in the first year. Job growth, meanwhile, lagged behind the national average and neighboring states. Financial ratings agencies, unimpressed with boasts of an impending boom, downgraded the state’s debt in 2014. Standard & Poor’s blamed Kansas’“structurally unbalanced budget” while Moody’s also cited the income tax cuts in lowering its outlook. The issue increasingly divided the GOP. Brownback won a narrow victory over a Democratic challenger in 2014, an otherwise strong Republican year, while promising his tax cuts needed more time but would create 100,000 new jobs and a rebound in revenue. But the budget problems persisted while economic growth remained modest. Facing growing calls from his own party to reverse the income and business tax cuts, Brownback pushed for alternative means to plug the budget gap. Over several years, the legislature extended and hiked a temporary sales tax and added taxes on cigarettes and alcohol, among other measures. The debate fractured the state’s Republican Party. In 2016, a wave of moderates took office promising an end to the tax experiment and more money for schools, some of which had announced they were shortening the academic year in response to a lack of funding. Bollier, who falls into the moderate camp, opposed Brownback’s plan from the beginning. She gained allies and converts as the backlash grew. Eventually, it was enough to override Brownback’s veto in June with support from both the Republican Senate majority leader, who had initially backed the tax cuts, and the Republican House speaker. Brownback complained they had taken “a big step backwards” and blamed factors out of the state’s control for the shortfalls. Stephen Moore, an economist at the conservative Heritage Foundation who has advised both Brownback and Trump on taxes, pushed back on the idea that what happened in Kansas should discredit the benefits of cuts. Moore pointed to North Carolina as a counterexample, where the population and economy have both grown in recent years while the state has slashed income taxes. He said observers should be wary ascribing too much power to tax cuts at the state level, since broader economic factors or policy changes can overwhelm their effects. 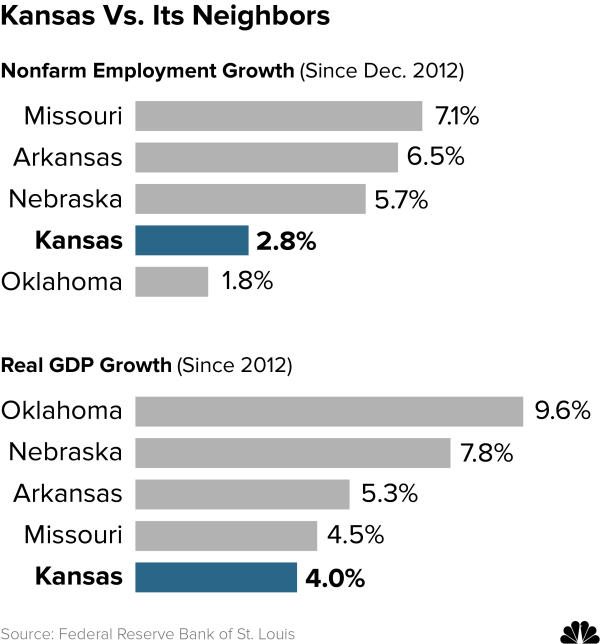 “Kansas is just one state and tax cuts are one of a dozen factors that explain why one state would grow faster than another,” he said. Moore is a leading evangelist for lower taxes, but he did agree with one prominent Democratic criticism of the Kansas tax experiment: The unusual cut for “pass-through” income that flows to business owners was a mistake. Academic research backs up Moore’s complaint. A study by four economists examined the Kansas pass-through measure and found that it had provided a major incentive for individuals to rejigger their finances in order to claim business profits that otherwise would have been taxed as individual income. That left the state with less revenue, but no apparent benefits to the economy. “We found essentially no changes in real economic activity, but changes in how income was reported in order to take advantage of the difference in rates,” Jason DeBacker, a professor at the University of South Carolina and co-author of the report, told NBC News. The Trump administration is currently proposing to reduce the rate on pass-through entities to 25 percent, which would be 10 points lower than the top income tax rate under the Trump/GOP framework. Economists across the spectrum are worried it could create a similar loophole to Kansas that would benefit the ultra-wealthy like the president, whose own businesses are organized as a series of pass-throughs. “I’ve talked to [Treasury Secretary Steve Mnuchin] and others about this. If we’re going to do this, make sure people can’t game the system,” Moore said. Republican leaders have said they will include measures to prevent wealthy individuals from exploiting the change, but have not yet identified them. Rep. Kevin Yoder, R-Kansas, argued last week to the Kansas City Star that the congressional plan is significantly different from the Kansas experiment. There could be another lesson for conservatives. Some supporters of Brownback’s cuts argue they were well-intentioned, but failed to take off because lawmakers lacked the political will to offset them with deep enough reductions in spending. While Trump administration officials are making spectacular claims about how their tax cuts will produce more revenue once the economy takes off, mainstream economists overwhelmingly say they will add significantly to the debt. Based on the party’s recent struggles to cut Medicaid spending, small government activists could find there’s little appetite for shrinking government to offset rising deficits later on. As Moore suggested, there are many factors besides taxes that influence growth, even though he predicted the GOP’s corporate tax cuts would be particularly helpful. The economy boomed in the ’90s after Congress raised taxes and produced middling growth before collapsing in 2008 after major tax cuts. Read more from NBC News here.